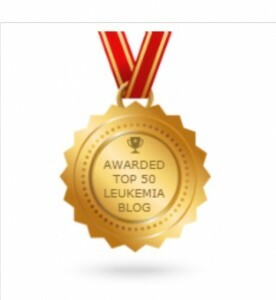 I was happy to learn that Feedspot has recognized this blog as a top 50 leukemia blog across all domestic and international leukemia sites on the web. I was actually 27th out of 50. The criteria used was a combination of Google reputation and search ranking, social media influence, quality & consistency of posts, and an editorial review by Feedspot’s team. Cool stuff. It’s nice to know that people are reading. This entry was posted in cancer, motivation and tagged chr, chronic lymphocytic leukemia, cll, Lls, Relentless Mettle - My Cancer, remissionman, someday is today. Bookmark the permalink. Both comments and trackbacks are currently closed.